Her name is Nui Harime and she claims to have killed Ryuko’s father, Dr. Matoi! What will Matoi do and why does Satsuki seem so unconcerned? Find out in the second part of Kill la Kill! Contains 10 episodes (Eps 10-19) across 2 Blu-Rays in deluxe packaging with artbook. 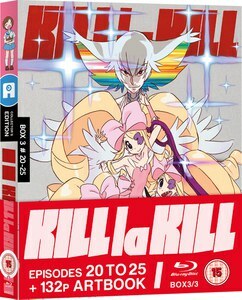 Japanese with English subtitles AND English dub included on disc.